Home » Health » What Is Carpal Tunnel Syndrome? Carpal Tunnel Syndrome or CTS is a condition that causes the fingers to experience the sensation of numbness, tingling, or pain. The most commonly affected parts are the thumb, middle finger, and index finger. Symptoms that occur usually develop slowly and will get worse at night. Carpal tunnel or narrow aisle at the wrist with an open end in the palm of the hand. The aisle is surrounded by the bones of the wrist at the bottom and the connective tissue (ligaments) that run across it. The median nerve travels through this aisle to provide a sensation of touch or touch to the palm of the thumb, index finger, middle finger, and half of the ring finger. In addition, the median nerve also provides power to the hand muscles to pinch or pinch objects by the thumb and the tip of the other fingers. When swelling of the nerves, tendons, or even both, the median nerve is compressed and results in carpal tunnel syndrome . In addition, some conditions such as pregnancy, arthritis, and repetitive movements can also trigger the occurrence of median nerve suppression. When the median nerve is squeezed or pinched, it will cause numbness, tingling sensation, and sometimes pain in the parts affected by this nerve. In addition to the tingling sensation, numbness or numbness, and the pain in the three fingers (thumb, forefinger, and middle finger), here are some other possible symptoms. Appeared like a pricked feeling on the fingers. Emerging pain that radiates into the hands or arms. Symptoms that occur can occur in one or both hands at once, but in most cases, CTS ultimately affect both hands. Carpal tunnel syndrome occurs because the median nerve is depressed or crushed. In most cases of CTS, the cause of the depression of the median nerve is still unknown. But there are some things that can increase the risk of someone suffering from CTS. Here are some things that can increase the risk of carpal tunnel syndrome . Family descendants who suffer from CTS. Pregnancy. Almost half of pregnant women experience CTS. However, these symptoms usually disappear shortly after the baby is born. Heavy and repetitive work by hand, like typing, writing, or sewing. Other medical conditions, such as rheumatoid arthritis and diabetes. The diagnosis of CTS can be done by the doctor directly with a physical examination of the hands and wrists, and ask some questions related to the symptoms you are experiencing. Electromyography or conduction studies of nerves. Sometimes, carpal tunnel syndrome does not require special treatment and will recover by itself. Especially in pregnant women, CTS will improve within three months postpartum. Symptoms of light and moderate CTS can be handled by wrapping the wrist with a small board. This hand bandage aims to minimize the movement that can trigger the median nerve suppression, especially the movement of the wrist to bend inwards. If this method of hand bandaging is less effective, the doctor may give a direct injection of corticosteroids in the affected area. This injection aims to reduce the inflammatory reaction of the median nerve. If both of these are unsuccessful, an operating procedure may be performed. Surgery may be the first choice if the doctor suspects signs of permanent nerve damage. Postoperative recovery from CTS may take a long time if the CTS case is severe enough. In fact, there is the possibility of no progress from the handling that has been done. Initially, carpal tunnel syndrome is characterized by the appearance of a sensation of numbness in your fingers at night. This symptom is probably caused by the hand and wrist are in a relaxed and flexible position while asleep. In addition, it can also be caused by the accumulation of fluid that resulted in the joints terkimpitnya. Finally, you will wake up with hands tingling and numbness. Become less sensitive to touch. Swelling, dry skin, or discoloration of the skin of the hand. The ability of the hand or finger affected by CTS will decrease, such as typing, buttoning, or lifting something with a finger. Use affected hands to move. Perform hand movements or wrists repeatedly. Not moving your hands or arms for a long time. Carpal tunnel syndrome is caused by the oppression of the median nerve on the wrist. This median nerve inflammation will affect the touch senses as well as your hand movements. The median nerve can be squeezed if the tissue inside the carnal aisle swells or the corneal passage narrows. Hereditary factors. According to research, CTS can be influenced by hereditary factors. If any of your family members are suffering from CTS, the risk you experience will increase. However, until now it is unknown how and why it can be affected by heredity. Injury to the wrist . Hand injury can be the cause of CTS, for example sprains and cracked bones can cause swelling and eventually put pressure on the median nerve. Injuries that occur can also change the shape of bones and ligaments in the hands. This change causes the median nerve to squeeze. Pregnancy . Nearly half of pregnant women experience CTS during pregnancy, but it is unknown why this can happen. Most cases of CTS in pregnancy recover by themselves after the baby is born. Women entering menopause also tend to have CTS. Work or activity involving hands . Activities that involve strong grasp, repetitive wrist movement, and strong vibration can trigger the emergence of CTS. Activities such as playing music, packaging parts work, and the use of chainsaws that involve a lot of movement using the hands. To date, further research is undertaken whether carpal tunnel syndrome is directly related to work involving multiple hand movements. Other medical conditions . The risk of developing CTS will increase due to some medical conditions, such as diabetes, hypothyroidism, obesity, and if taking drugs for cancer such as exemestane . Gender . Women have carpal tunnels smaller than men. Therefore, CTS tends to be more common in women. A physical examination directly by a doctor can determine the diagnosis of carpal tunnel syndrome in a person. Here are some tests that can be done to determine the diagnosis of CTS. Physical tests . The doctor will examine the touch senses of the fingers affected by the median nerve. In addition, doctors A slight pat on the wrist can make you feel the symptoms of CTS (tingling and numbness). Your doctor may also ask you to raise your hand over your head for a few minutes to see if it can lead to CTS symptoms. Blood test . If the CTS you are experiencing is caused by another medical condition, then your doctor will recommend that you do a blood test. Some other diseases that can cause CTS are rheumatoid arthritis, diabetes, and hypothyroidism. Electromyography or conduction studies of nerves . This procedure is performed to test the speed of electrical signals that are drained into the hand nerve. The results of this test can show how much damage to the nerves of your hands. Ultrasound imaging . This test is useful to see the nerve structure more clearly, and especially if there is a suspected mass or tumor suppressing the median nerve. C arpal tunnel syndrome often does not require special treatment because this condition can recover by itself within a few months. If CTS does require treatment, then the treatment depends on the severity and how long you have suffered from this condition. For those who suffer from CTS during pregnancy, usually the symptoms that appear will disappear about two to three months after giving birth to a baby. But if the condition of CTS is severe enough, further treatment should be done. Wrist splinting . This procedure aims to place the wrist always in a neutral position. 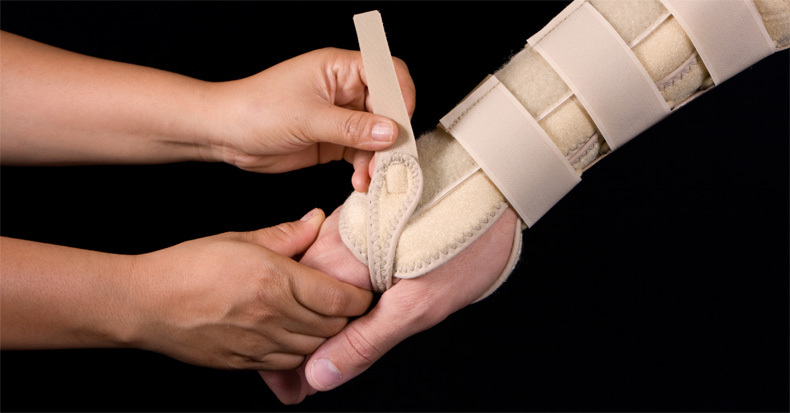 Splinting is usually not going to burden the carpal aisle. A bending wrist may increase the pressure on the median nerve. When the wrist is bandaged and does not move much, the pressure on the nerve will decrease. As a result, the symptoms will quickly decrease. Non-steroidal anti-inflammatory drugs (NSAIDS) . There is no clear evidence that NSAIDs such as ibuprofen, can help treat CTS. Nevertheless, these drugs can help relieve the pain that appears for the short term. Corticosteroids . These drugs contain powerful chemical compounds to prevent inflammation. These drugs may take the form of tablets, but especially for the treatment of CTS, you will be given corticosteroid injections on the wrist. Operation . This procedure is performed if other treatment techniques are not successful. The operation for CTS is better known as carpal coral decompression or carpal tunnel release operation. There are several choices of surgical procedures that can be done, you can discuss with your surgeon to find out the most appropriate way for your condition. Symptoms of CTS continue as surgery is unsuccessful. Pain on the wrist, but different from the symptoms of CTS. Appears complex regional pain syndrome (CRPS), a chronic condition that causes pain in some parts of the body. After undergoing CTS surgery, usually the patient will recover completely. The wrist will remain bandaged and you will wear a sleeve support for several days postoperatively. To keep your fingers and hands from swelling and feeling stiff, your hands should stay up for two days. Do light exercise on fingers, shoulders, and elbows after surgery. Should avoid physical activity that requires a large force on the hands in operation. However, you are usually allowed to do some activities such as driving, self-care activities (bathing, changing clothes, eating, etc. ), as well as exercises grasping and lifting light goods. The ability to grasp and pinch will usually return to normal 2 to 3 months after surgery. However, the recovery process may extend up to one year if the median nerve damage before surgery is too severe. Below are some ways you can do to prevent carpal tunnel syndrome. Avoid bending the wrist repeatedly. A leisurely wrist position is the best position. If you're typing with the keyboard, it's best to position your wrists as elbows or slightly lower. If you work or do activities that utilize the wrist, do break more often to avoid pressure. Do a warm up or a small workout for your fingers and wrists. Try to sleep with the wrist position fixed straight. If you are working in a cold environment, use gloves to keep the hands from getting cold. Cold temperatures can cause pain and stiffness in the hands. 0 Response to "What Is Carpal Tunnel Syndrome?"